Traditionally, orthodox Jews between Pesach and Shavu‘ot celebrate a minor festival, Lag Ba‘Omer. This festival occurs on the 33rd day of the Omer. Also traditionally, Christians celebrate a festival on the 40th day after Yeshua’s resurrection, Ascension Day. The question thus presents itself whether Torah observant Messianics should celebrate these days, and if so, in what manner. A calendrical difficulty must be clarified first. For, as we have pointed out in other articles — and as has been noticed by others — the orthodox Jewish method of counting the Omer is in conflict with Scripture. [i] And it needs no argument that the Gregorian method of calculating the calendar can afford no biblical basis for fixing the date of Ascension Day. But this difficulty is only a minor one. Once the correct method of counting the Omer is established, it is easy to fix the 33rd and the 40th day of the count. If we start the Omer on the Sunday after 14 Nisan, which we have established as the biblical date, the two celebrations of Lag Ba‘Omer and Ascension Day occur on two succeeding Thursdays, during the fifth and the sixth weeks of the Omer respectively. Although the attempt to date the first occurrence of the Manna on the 18th of Iyar in R. Zevin’s quote of Chasam Sofer appears a bit forced — the Torah text only says that the Manna began soon after the 15th and even apart from this uncertain date there is no biblical connection between the 33rd day of the Omer and the calendar date of 18 Iyar — it is exactly this biblical theme of the Manna that contains a possible clue for a Messianic relevance of the festival. The bread from heaven is a well-known theme in the Apostolic Writings with clear references to Yeshua (cf. Jn. 6:26-58; Apoc. 2:17). From the fact that Yeshua is our bread of life descended from heaven we might have a first and somewhat speculative intuition about the number 33. Why is it the 33rd day of the Omer that is so important? We know that Yeshua’s earthly life lasted 33 years. It may thus be that we should view the first 33 days of the Omer as a kind of liturgical representation and recapitulation of Yeshua’s first mission, when he came down from heaven as the bread of life, according to Jn. 6:33: “For the bread of G-d is he which cometh down from heaven, and giveth life unto the world”. A week later, on the 40th day of the Omer, we celebrate Yeshua’s ascension, when he was elevated to the right hand of HaShem. This may indicate that Lag Ba‘Omer and Ascension Day symbolize two complementary and opposite movements in the ministry of Messiah. On Lag Ba‘Omer we are reminded of Messiah’s descending to this earth and of his earthly years; on Ascension Day we are reminded of his ascension to the Father. Ascension Day occurs on the eight day after Lag Ba‘Omer. The eight day symbolically refers to that which transcends this world, because there are only seven days in a week. The week of this creation symbolically signifies our existence in this world. The eight day signifies the World to Come. Yeshua’s ascension occurs on the 40th day after his resurrection. The number 40 is the number of trial and wandering, of preparation. The Israelites wandered through the desert during 40 years, before they were able to conquer the promised land. At the beginning of his ministry Yeshua was in the desert during a preparatory period of 40 days, to be tested and tempted (cf. Mt. 4:1; Mk. 1:12-13; Lk. 4:1-2). After his resurrection he began the second phase of his ministry. He went through another period of 40 days and was seen by the apostles, “speaking of the things pertaining to the kingdom of G-d” (Acts 1:3). During these days he instructed his talmidim and prepared them for their great mission that would begin at Shavu‘ot (Acts 1:4-5). After these 40 days he was taken up and entered the realm of Heaven, to be seated at the right hand of G-d (Mk. 16:19). Does the messianic interpretation of Lag Ba‘Omer make sense in the light of the traditional themes of this day? What are we to make for instance of the tradition of the twelve thousand pairs of students of Rabbi Akiva dying between Pesach and Shavu‘ot? This tradition has led to the acceptance of mourning practices during the Omer count. And this practice of mourning at first sight appears to stand in strong contrast, or opposition, to our joy about the resurrection of Messiah at this time. 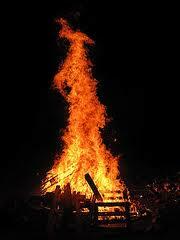 A number of additional observances of Lag Ba‘Omer, e.g. the traditional haircut, are related to this time of mourning, which is intermitted on this day. And how should we view still other observances connected with it, such as the lighting of bonfires and visiting the tomb of Rabbi Shimon bar Yochai? It is clear that we cannot accept these practices without duly screening their legitimacy and validity from a messianic viewpoint. We know that Rabbi Shimon bar Yochai was a student of Rabbi Akiva and that Rabbi Akiva was a determined adversary of the Jewish followers of Yeshua and that he tried to destroy them by proclaiming the false Messiah Bar Kochba. But perhaps we can make something of the events and observances associated with Lag Ba‘Omer by considering them from the viewpoint of their symbolic and perhaps somewhat hidden meaning. What are all these things about? There are reasons for asking this question, for there are a lot of difficulties and oddities in the traditional stories told about this day, and in the observances connected with them. We noticed that, according to the tradition, the deaths of the students of Rabbi Akiva stopped on the 33rd day of the Omer. In the Talmud (bYevmoth 62b) it is said that these students died because they did not show proper respect to one another. This accusation sounds very similar to the reason always given for the destruction of the second Temple: baseless hatred (sinat chinam (bYoma 9b)). The Apostolic Writings confirm this diagnosis in an aggravating manner. Before Yeshua symbolically “went out and departed from the Temple” (Mt. 24:1) and held his final Olivet discourse (Mt. 24:1-25:46), he concluded with a lament over Jerusalem, saying: “O Jerusalem, Jerusalem, thou that killest the prophets, and stonest them which are sent unto thee, how often would I have gathered thy children together, even as a hen gathereth her chickens under her wings, and ye would not! Behold, your house is left unto you desolate. For I say unto you, Ye shall not see me henceforth, till ye shall say, Blessed is he that cometh in the name of HaShem” (Mt. 23:37-39). Yeshua’s announcement of the destruction of the Temple clearly reveals the deeper cause of the catastrophe that was to come upon the Jewish nation: its refusal to be united under the guidance of the true Messiah and to let its divisions be healed by him. And this draws our attention to the Roman wars and to the final and desperate endeavours of Rabbi Akiva and his followers to create a false national unity by expelling and cursing the followers of Yeshua. By his deliberate attempt to destroy the believing remnant of Israel, Rabbi Akiva for a very long time destroyed all hope of the nation, his own efforts for a restoration of its independence included. By the Bar Kochba war Judaism completely separated itself from the believers in Messiah Yeshua, and was itself separated from the Messianic Kingdom that had been so near to it during the days of Yeshua and the Apostles. The tradition that the students of Rabbi Akiva didn’t show proper respect one for the other thus confers to us in a distorted way a deeper spiritual understanding of the mourning during the Omer. The mourning during these days is for the loss of all national messianic hopes for thousands of years. The mourning is not for the students of Akiva in a narrow sense, but for all his followers, and, as R. Stolper writes, “for the failure of the Jewish people to bring about the Messianic Age, for the fall of the curtain on Jewish independence, Jewish hopes and Jewish messianic ambitions”. [x] After the expulsion of the believers all Israel was brought under the yoke of rabbinic authority that was established by Rabbi Akiva. In this way all future Jews were made Akiva’s students. The mourning associated with them thus turns out to be a mourning for the whole Jewish nation. Unknowingly — and unconscious of the real state of affairs — the nation mourns for her own failure to recognize the true Messiah, Yeshua. That is the solution for the inconsistency detected above by Rabbi Stolper. All those who belong to rabbinic Judaism are Rabbi Akiva’s students, and they mourn for themselves and for the condition of the Jewish people. What, from this perspective, is the meaning of the celebration of Lag Ba‘Omer? From our messianic perspective we feel compelled to say that it is the hidden spark of hope under the ashes that could not be destroyed by all the failures of Israel and all the cruelties of the Roman Empire. This spark of hope was Messiah Yeshua, crucified and resurrected in the 33rd year of his life. He was and is and remains the foundation for the future redemption of all Israel. The atonement that he wrought on the Cross and the resurrection life he obtained are his definitive achievements that remain for all times and can nevermore be destroyed. Messiah has conquered and defeated the strong and evil forces behind sin and death, and therefore on the 33rd day of the Omer we as Messianics can celebrate the ceasing of deaths because we have life in him. It is no mere coincidence that Lag Ba‘Omer is celebrated about the date that initiated the miracle of the Manna. For Yeshua is that “bread of life which cometh down from heaven, that a man may eat thereof, and not die” (Jn. 6:50). Lag Ba‘Omer thus contains the deepest mystery: the Messiah, in whom are hidden the secrets of everlasting life and the divine promise of the future restoration of all Israel. Now we can try to discover the reasons for the other observances connected with Lag Ba‘omer mentioned above, the lighting of bonfires and visiting the tomb of Rabbi Shimon bar Yochai. By this development we see how the rejection of the true Messiah and the rising of kabbalistic mysticism became intertwined. Once the true spiritual renewal of life was refused, inevitably another path to redemption had to be sought. Once the true Messiah was rejected and his talmidim were step by step expelled from the Jewish nation, and the following generations saw the terrors of the Roman war, the destruction of the Temple, the national breakdown and the exile, new spiritual resources were needed for Judaism to survive. These resources were found in the form of an occult mysticism that seems to have begun with the rabbis of the second century CE. This is the sad route a considerable part of Judaism has taken. The P’rushim and the early rabbis had already begun to dilute the biblical faith by embracing the doctrine of the immortality of the soul and the practice of prayers on behalf of the dead. The later mysticism, that was strongly influenced by Neo-Platonism and Gnosticism and culminated in such works as the Sefer Yetzirah, the Sefer Bahir and the Zohar and similar works, went much further and accepted reincarnation, magical interpretations of the mitzvot, a whole lot of other occult practices, and a panentheistic concept of G-d.
From a messianic perspective the kabbalistic path of redemption is an illusion, a dream-world not rooted in the Scriptures. The mysticism that we find expressed in the Zohar offers a spiritualistic mythology, though this mythology takes the outward form of biblical interpretation. In this way the words of Scripture in fact become the vehicles of a new religious structure inspired by Neo-Platonism and Gnosticism. Under the guise of conformity to Scripture an entire new world of entities and concepts is introduced that is essentially incompatible with the basic teachings of the Torah and the prophets. The customs of lighting bonfires and having celebrations at the tomb of Shimon bar Yochai at first sight are of a similar paradoxical nature as the perplexities we met in the aforementioned mourning for Rav Akiva’s students. How can a Yahrzeit be celebrated in the manner of a joyous festival and be marked by bonfires? We have already argued that the mourning for Akiva’s students betrays, in a distorted manner, the mourning of the entire Jewish nation for not having known the time of her visitation (cf. Lk. 19:44). We must assume that the false renewal of Judaism by means of the esoteric mysticism of Bar Yochai and his followers, in a similar distorted manner, testifies for the true renewal of life that has come in Messiah Yeshua. There is only one tomb in the world that truly is a site of joy and that speaks of him “who hath abolished death, and hath brought life and immortality to light” (II Tim. 1:10). This should lead us to consider the proper way for Messianics to celebrate Lag Ba‘Omer. For it is clear that we cannot simply take over the celebrations found in orthodox and chassidic circles. And yet we have seen that there is a deep symbolism referring to Yeshua inherent in this day. Perhaps the best way for Messianics to celebrate Lag Ba‘Omer is by aligning ourselves to the biblical symbolism we have discovered, of Yeshua being the bread of life. By interpreting the number 33 as a recapitulation of Yeshua’s lifetime here on earth we have the occasion for a glad and joyous commemoration of the life and times of our Messiah. And how could we better commemorate him than by keeping the memorial he himself instituted and which we call ‘the Lord’s Supper’? In it we feed ourselves with the bread of life, and we experience that “the bread that I will give is my flesh, which I will give for the life of the world” (Jn. 6:51). We experience that true mystical union between the Head of the Body and its members, when “he that eateth my flesh, and drinketh my blood, dwelleth in me, and I in him” (Jn. 6:56). On the eve before Pesach, at b’dikat chametz, we remember that Yeshua instituted the Supper in the face of his approaching death. While the joy of that celebration is overshadowed by the impressive and solemn events of our Master’s trial and crucifixion the next day (Nisan 14), the emphasis of the celebration on Lag Ba‘Omer is on our joy in him and our living communion with him. As the Apostle says: “Now, if we be dead with Messiah, we believe that we shall also live with him: Knowing that Messiah being raised from the dead dieth no more; death hath no more dominion over him” (Rom. 6:8-9). And as Yeshua himself testified: “As the living Father hath sent me, and I live by the Father: so he that eateth me, even he shall live by me” (Jn. 6:57). We don’t have to gather at the tomb of R. Shimon bar Yochai on this day and we don’t have to lit Yahrzeit candles. We may celebrate that we have a living Messiah by lighting bonfires and candles of joy, in honour of him who is the true and everlasting king of Israel. It is also appropriate to have a haircut on this day. To let one’s hair grow is a sign of mourning and to have a haircut is a sign of joy. Obviously, we rejoice throughout the entire period of the Omer in the resurrection of Messiah. But a slight sense of mourning is also characteristic of this period. First, because, as we have explained above, the Jewish nation is still in a state of unbelief and refusal concerning Yeshua. The restoration of all Israel in Messiah is still awaiting. Second, because Messiah in his resurrection glory is in a sense detached from his followers who are still in the exile of their mortal bodies. There is also a mystical signification in the haircut. It reminds us of the cutting of the sheaf of the Omer, which by this cutting was detached from the earth. The cutting of the sheaf, on the first day of the Omer, and our haircut on Lag Ba‘Omer, are thus symbols of the fact that in his resurrection Messiah is detached from us and from this world’s life, and has now entered the completely sanctified state of the life of the World to Come. By this manner of celebration Lag Ba‘Omer finds its natural complement in the celebration of Messiah’s ascension on the 40th day of the Omer. On Lag Ba‘Omer we recapitulate Messiah’s life; a week later, on Yom HaAliyah Yeshua, we celebrate Messiah’s elevation to the right hand of the Father, and his installation as head over all things. Both celebrations lead up to the great Yom Tov of firstfruits, Shavu‘ot. On Shavu‘ot Israel received the Torah and was dedicated unto G-d as the holy firstfruits of mankind. On the Shavu‘ot in the year of Messiah’s resurrection the Ruach HaKodesh was outpoured on the believing remnant of Israel, which was dedicated unto G-d as the firstfruits of the nation. May we, believers in Messiah Yeshua — born Jews or added from the Gentiles — all be faithful members of this remnant. [ii] Zevin, p. 887. Rabbi Shlomo Yosef Zevin, The Festivals in Halachah: An Analysis of the Development of the Festival Laws (Vol. II), Mesorah Publications, ltd. New York in conjunction with Hillel Press Jerusalem — Brooklyn NY · Jerusalem 2002 (1999). [iii] Zevin, o.c., p. 888. [vi] Zevin, o.c., p. 887. [xiii] Laenen, pp. 193-208. J.H. Laenen, Joodse mystiek. Een inleiding, Kok-Kampen · Lannoo-Tielt 1998.